This is another play adaption. This one was performed at in the 70s and it was supposed to be starring a Doctor that hasn't been seen on the show. A new character of an old character. This plot sounds a lot like The Keys of Marinus, which is not really a good thing. Maybe it's good! 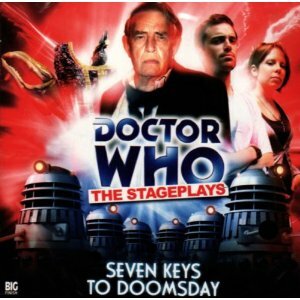 "A newly regenerated Doctor takes his young companions, Jenny and Jimmy, to the desolate world of Karn. There they must face terrifying monsters, and brave fiendish traps to locate seven crystal keys. If they fail in their task, the Doctor’s arch enemies, the Daleks, will unleash their evil upon the entire universe!" What did you think? Would this work as a play? Would it be too ambitious with its settings? How about those Daleks? Well, this was better than the last stage play adaption. There weren't any ridiculous songs. The Doctor in this reminds me a bit of the first Doctor, very strange just hearing another incarnation of him that doesn't fit. Jimmy and Jenny were okay as companions. I mostly found Jimmy annoying until the very end. Jenny was good, but nothing spectacular. The plot is rather blah. Daleks building an ultimate weapon to take over the universe! There's a shock. I think the ending works well if you sort of view this as a stand-alone production. It actually would work as a decent introduction for someone who hasn't seen or heard anything Doctor Who. The plot was more interesting, but yet another Doctor Who formula of getting all the pieces of the puzzle (Keys of Marinus, Key to Time). It was good, but for a medium that is already outside of canon this felt even more unofficial.